On the map, this appears a tiny, remote place, down a narrow lane lost in the hills of south-west Suffolk. This pretty little church sits in an idyllic little churchyard in the rolling hills to the north-east of Haverhill. The setting is intensely rural, spoiled only by the vast meat processing plant visible beyond the trees in the valley below. There is no tower, and the bellcote-surmounted tiny nave makes this appear a dolls house of a church. It is pleasantly Victorian in character; this belies the fact that we are on a hill-top in a circular churchyard, and so probably in an ancient place. You can make out the towers of two other hilltop churches from the edge of the churchyard. Perhaps uniquely for this part of East Anglia, this church is kept locked without access to visitors. The churches on the Cambridgeshire and Essex sides of the border are all open, the Suffolk churches tend to be locked with a keyholder notice, but here even that hope gives out. It feels a rather unloved place, although recent notices in the porch suggested that it hasn't been abandoned completely yet. I have gone into eloquent detail elsewhere on this site about what it means if a parish keeps its building exclusively as a posh venue for the Sunday club, so I won't bang on about it here. Suffice to say that I assume they will never apply for any grant aid. 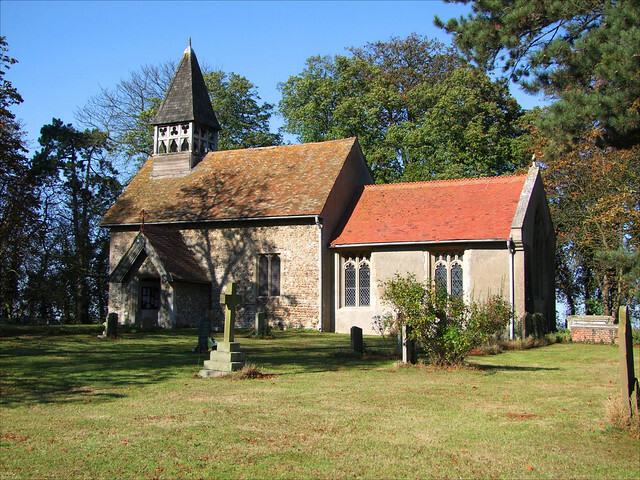 The most interesting thing about Little Wratting church can be seen from the outside. This is the dedication stone placed above the south door, within the modern porch. The writing appears Saxon, although the meaning is unclear. Such things are common elsewhere, but most unusual in East Anglia. It is not beyond possibility that it did not come from here originally, but was purchased by some enthusiastic antiquarian and put in place when the church was restored in the 19th century. The door beneath is probably 12th century, wood, iron and all. We had to use a magic wand to get inside. The interior is rather gloomy, and has that slightly shabby character you find in those churches, and other places of course, where they know there aren't going to be any unexpected visitors. The large box pew surviving at the west end sits below the war memorial and was lined with wreaths, although it was rather cluttered with junk as well. There are some medieval benches to the east of it, and the view east is dominated by a surprisingly successful early 20th Century chancel arch, which I think must be made of concrete. An image niche is set in it, and the little screen within is most elegant. One great curiosity is that there is a fragment of arcading set in the north-west corner of the chancel, just beside the chancel arch. This is a tiny survival of a chantry chapel that once stood to the north of the chancel, dedicated to the Turnour family, but demolished in the early 18th century. The kneeling woman on a fragment of stone that sits on a window ledge is probably from one of the Turnour memorials.